I returned home to find the hydroponic system I built at home in a sad state. Several preventative measures had not been taken to ensure the survival of the crops in the system. With many of the old plants coming out, I had to make sure the new ones being placed it would stay alive. Here are the main things I had to take care of. How the system looks now. There are a few vacancies needing to be filled. 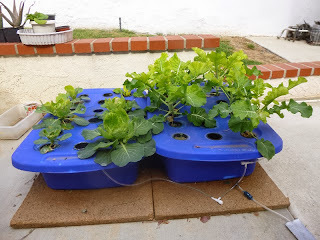 Periodically, the water should be changed in a DWC system. Not only do the nutrients get depleted, but bacteria and other organisms can grow in there. A simple refreshing of water is sometimes the best course of action. Changing water is as easy as removing the old water (it can be put on soil plants in the garden), adding new nutrients, and refilling with new water. I add the nutrients first so the action of adding water mixes them in. A heat wave hit my part of the country, bringing highs of 80°F in December. The lettuce were not taking it well and many died. But I realized that was not the only problem affecting the lettuce in that bin, the airstones were not bubbling in that bin. At first I thought my T valve had failed, so I went to buy some actual regulatory valves. I soon found out the it wasn't that, but the airstones were clogged. So then I went out to buy some replacement stones and the aeration worked fine again. I'm keeping the valves there too because the extra control can never hurt. Additionally, I upgraded the pump to the one I use back at my apartment. It only cost $15 and the airflow has never been better. I also noticed a lot of small round balls on the lid of the system. 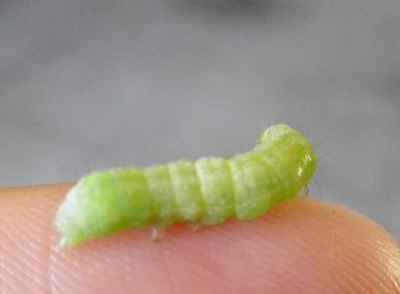 I had seen those before when dealing with the cabbage at my apartment -- caterpillars. They had taken over both bins; there were holes on the remaining Napa cabbages, but I only found a few caterpillars left on the lettuce plants. I removed all the lettuce plants anyway since they were scraggly looking. This gave me the opportunity to space out the new broccoli and cabbage planted in the system. Hopefully those caterpillars go away.